No, that's not rule by one's buddies, but rule by the worst elements of society. 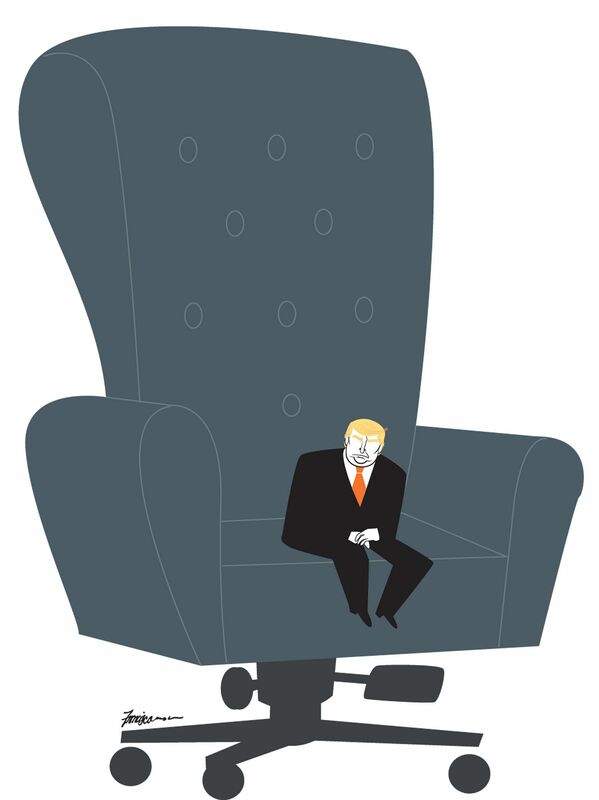 United States President Donald Trump's administration is a kakistocracy - and no, that does not mean a government of one's buddies, or kaki in Singlish, although Singaporeans might be inclined to think so. And to think it was in the dictionary all along: "Trumpery. Noun. Worthless nonsense; tawdry finery. From the French tromper, to deceive." We are now into the second month of the three-ring circus that is the Trump presidency, as what seemed inconceivable became unbelievable but is now undeniable. In an electoral upset that made the self-inflicted wound of Brexit appear to be but a scratch, the US chose a reality-TV star and sometimes-bankrupt real estate mogul as leader of the free world. Accepted wisdom during the campaign was that liberal elites had taken Mr Trump literally but not seriously, while his supporters took him seriously but not literally. As the past six weeks have shown, he might not have expected to win - but he was serious about his campaign promises and he meant many of them literally: building a border wall with Mexico, imposing a ban on Muslim immigration, abandoning America's role as the champion of free trade and globalisation. His victory, like Brexit, was not merely a rejection of established political custom - though it was surely that. It was a rejection of politics itself, meaning the art or science of government as such. In the lead-up to the Brexit vote, then British Justice Secretary Michael Gove was asked to name a single economist who supported the country's exit from the European Union. His revealing answer was that "people in this country have had enough of experts". Much as Brexit was a vote for the abyss, 25 per cent of Americans who voted for Mr Trump did so despite believing he was not qualified to hold office. He is the only president in US history to enter the Oval Office without prior governmental or military experience. Since the inauguration, he has sown confusion and fear abroad, caused needless suffering in the roll-out of immigration restrictions at home, and taken a perverse pleasure in waging war on institutions such as the media and the judicial system. His presidency is a challenge to the very notion of reason-based discourse that makes politics possible. Politicians often play fast and loose with the truth, but outright lies coming from the White House are now routine - prominently including claims that more people attended his inauguration than any other (they did not) and assertions that he won by more electoral college votes than any recent president (he did not). It is telling that these untruths are among those most repeated, because they support the two things that appear most important to Mr Trump: his ego and his legitimacy as president. Other more substantive challenges, such as the involvement of Russia in his election, are simply dismissed as a "ruse" or "fake news". Notoriously, Trump acolyte Kellyanne Conway defended one reality-defying statement by saying that the administration was offering "alternative facts". Much has been made of this exchange, but the use of power to define reality is not new - just take a look at North Korea's news. Even in the US, political consultant Karl Rove, consigliere to former president George W. Bush, once spoke dismissively of people who lived in the "reality-based community", whereas those in power "create our own reality". Mr Rove, at least, was speaking off the record. Given today's new normal, there is little wonder that George Orwell's 1984 has returned to the bestseller lists. Two thousand years before Orwell, Plato warned in The Republic that democracy would eventually give rise to tyranny: Populist fears of oligarchy would enable a demagogue to take power, establishing the conditions for tyranny. I say all this as an academic acutely aware that I am part of the elite discourse so robustly rejected in Britain, the US and elsewhere. The dictionary offers a lesson here, too. As a noun, an "academic" refers to a teacher or a scholar - an expert who (one hopes) offers relevant insights and wisdom to his or her students and the wider community. As an adjective, however, if something is said to be "academic", it is irrelevant, of no practical or real-world application. Certainly, in what passes for politics today, academics have largely become academic. Soon after Mr Trump's victory last year, Oxford Dictionaries declared "post-truth" to be the word of the year. It refers to the manner in which "objective facts are less influential in shaping public opinion than appeals to emotion and personal belief". It is tempting to dismiss Mr Trump as a tyrant or a crook. His disdain for the rule of law supports the former view; peddling his daughter's wares from the Oval Office while advancing his eponymous company's brand go towards the latter. His rule might then be described as an autocracy or a kleptocracy. Yet, neither word fully captures the Trumpian moment in which we find ourselves, or explains his small but enthusiastic support base. In a world of "fake news", his supporters voted him into office either knowing that he couldn't possibly deliver on many of the promises he made - or not caring whether he did or not. More importantly, he struck a chord with some Americans who feel so abandoned by existing political structures that they voted for him precisely because he would bring those institutions crashing down around him. Here, the last word of his campaign slogan, "Make America Great Again", is the most important, hearkening back to an era when American dominance was unquestioned, but also when white working-class men in particular enjoyed a dignity now seen as threatened by diversity and globalisation. There is, as it happens, a word that does describe Mr Trump's style of government. It is kakistocracy. In Singapore, this might have a very different connotation of government by one's buddies. Mr Trump's appointments do suggest he values loyalty, but kakistocracy means government by the worst elements of society. It captures the fear-mongering, the racism and the sexism - the visceral rejection of reasoned compromises in favour of a bare-knuckled will to power. So, should liberal democracy fold up its tent and go home? As bad as things are, there are at least three reasons for optimism. First, the American political system was designed precisely to avoid one man bringing the country to ruin. The US Constitution puts Mr Trump in charge of the executive, but he cannot pass laws and is subject to judicial review. The Republican legislature seems to have no desire to question the Faustian bargain they have struck, but at least the courts are defending the rule of law. Mr Trump's attacks on those courts have been characterised, quite rightly, by the deans of Harvard and Yale law schools as attacks on the Republic itself. Second, America's allies and the rest of the world are realising that they can no longer take US leadership for granted. US power has been in decline for more than a decade; Mr Trump's neo-isolationism is merely accelerating a trend. His cavalier approach to foreign policy is certainly destabilising: flirting with Taiwan, dropping a two-state solution in the Middle East, threatening to blow a Russian ship "right out of the water". But in each case, he moved back from the precipice: reverting to the orthodoxy of "one China", adopting a more conservative position on the Arab-Israeli conflict, and sharing with mystified reporters that he had been briefed that war with Russia would mean a nuclear holocaust "like no other". Meanwhile, China has stepped into the breach as a political and economic leader, even as the EU is being forced to re-examine its own role in the world. A third cause for hope is that, in America and elsewhere, people are realising that fake news is a real thing and that quality news is worth paying for. Blatant falsehoods circulated during the campaign, many from the hundred pro-Trump websites run by Macedonian teenagers. After a decade of falling sales, newspapers are now seeing subscriptions go up (online, at least). The New York Times alone added a quarter of a million subscribers in the months after Mr Trump's victory. Even Fox News, long a Trump enabler, appears to realise that he has gone too far, even for its credulous viewers. Mr Trump is not crazy; nor is he evil. But his presidency is a canary in the mineshaft of our public discourse. Its implosion is an indicator of the toxic nature of that discourse, and might yet spur us to aspire to something better. "Americans will always do the right thing," Winston Churchill once observed, "after they've exhausted all the alternatives." The US and the world will survive the Bloviator-in-Chief. But when he completes his term(s), or is impeached or declared unfit for office under the 25th Amendment, it would be a mistake to regard him as the cause of a failing political system when he is only a symptom. The writer is dean of the National University of Singapore Faculty of Law.